ASUS M4A78T-E PCSTATS Review - AMD 790GX Chipset - Videocard or IGP? AMD 790GX Chipset - Videocard or IGP? The AMD 790GX chipset is designed for higher 3D and video performance than previous AMD Integrated Graphics core logic. It's the third integrated video chipset from AMD to feature DirectX 10 capability, and serves as the high-octane upgrade to AMDs popular 780G/690G family. AMD's 790GX chipset supports all AMD 32-bit/64-bit Socket AM2 CPUs, Socket AM2+ Phenom and Athlon processors, and the new Phenom II Socket AM3 family (depending on what the motherboard manufacturer builds). With a socket AM3 or AM2+ processor installed, the CPU communicates with the AMD 790GX chipset over a HyperTransport 3 (HT3) connection. For legacy socket AM2 processors, a HyperTransport 2 (HT2) connection is used. The AMD 790GX core logic is built on TSMC's 55nm manufacturing process, draws 0.95W power, and contains 205 million transistors. By comparison, the AMD 690G contained 72 million transistors, drew 1.4W power, and was fabricated on the 80nm process. The 938-pin AM3 socket. Socket AM3 processors are backwards compatible with AM2+ sockets, but socket AM2+ processors are not forwards compatible with socket AM3 because those processors do not have a DDR3 memory controller. The AMD 790GX core logic is based on the venerable 780G chipset, but with an overclocked integrated graphics core and dedicated 128MB of DDR3-1333 side port memory. In every real sense, the AMD Radeon HD 3300 integrated graphics is more an integrated videocard than a true IGP which leaches its memory from the system. While the Radeon HD 3200 GPU integrated into the 780G chipset ran at a 500MHz core clock speed, the Radeon HD 3300 that's part of AMD's 790GX chipset has been bumped up to a 700MHz core clock. Other than the increase in speed, this chip is quite similar to its older sibling. Both IGPs are built on the 55nm manufacturing process, have 26 lanes of PCI Express connectivity, connect to the processor with HyperTransport 3.0 and use AMD's Unified Video Decoder to offload processing of high-definition H.264, VC1 and M-PEG2 content from the processor. The AMD SB750 southbridge is a different story, and has changed quite a bit from it predecessor the AMD SB700 which was paired with the AMD 780G chipset. This new southbridge now supports RAID 5, in addition to the RAID 0, 1 and 10 functionality. AMD's SB750 southbridge also makes use Advanced Clock Calibration (ACC); this is an interconnect that runs directly from the southbridge and into the CPU socket. Due to the increased graphics capabilities of the integrated graphics controller, the AMD 790GX chipset supports Crossfire X, although at reduced bandwidth rates than can be found on non-integrated graphics motherboards. The AMD 790GX's Crossfire is limited to x8/x8 lanes of PCI Express bandwidth. While this clearly isn't as nice as having a x16/x16 Crossfire configuration, it's still more than enough that even high-end graphics cards like the Radeon HD 4850 won't become bottle necked. The ASUS M4A78T-E motherboard has 128MB of 1333MHz DDR3 Sideport memory, which serves as a high-speed cache for the Radeon HD 3300 before it has to dip into the DDR2 memory banks that are shared between the integrated graphics processor. As we've seen from previous reviews, the Sideport memory does add a few extra frames per second to the Radeon HD 3300's performance in 3D games, but usually it's still not enough to make most modern 3D games playable. Hybrid Crossfire allows the integrated Radeon HD 3300 graphics processor to pair with a Radeon HD 3450 videocard, and when running together these two graphics processors can be about as powerful as a Radeon HD 3650. Most recent integrated graphics chipsets from AMD, nVidia and Intel have had the capability of connecting via analog or DVI monitor cable. If the board supported DVI, that meant it was capable of HDMI should the manufacturer choose to implement it. The AMD 790GX follows a similar path with dual display controllers supporting analog VGA and DVI/display port/HDMI outputs. Although it would be nice to use a DVI monitor and output HDMI to an adjacent big screen, with one digital display controller it's an either/or/situation; either DVI or Display Port or HDMI (at least all are HDCP compliant). And don't think you can use that DVI-to-Analog converter, you can't. It's time to do some overclocking with this new AMD motherboard. 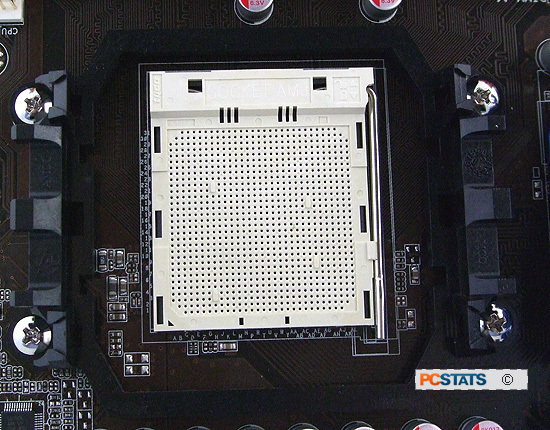 How will DDR3 affect the Asus M4A78T-E's overclocking performance? Pg 5. — AMD 790GX Chipset - Videocard or IGP?